The mission of Lutherans For Life is to equip Lutherans to be Gospel-motivated voices For Life. 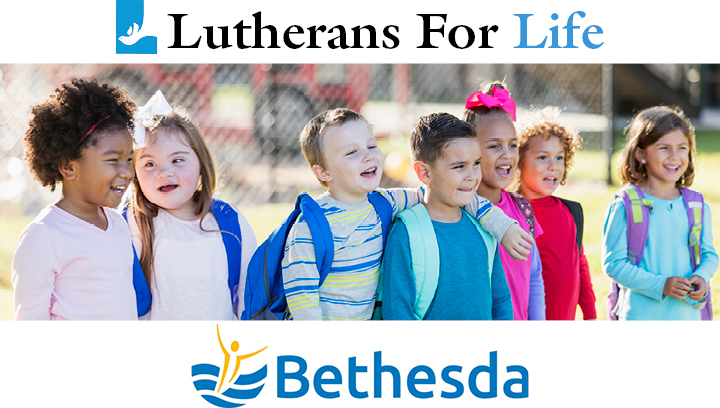 The mission of Bethesda is to enhance the lives of people with intellectual and developmental disabilities through services that share the good news of Jesus Christ. We rejoice that the missions of our respective ministries share a common foundation: that God has created, redeemed, and called every human being—of any age, appearance, and ability—to be His own precious treasure forever and a special privilege to His people. We both believe that speaking this truth means showing Christ’s love. His forgiving and saving grace makes up for all humankind’s shortcomings, works through all our weaknesses, and sanctifies all our differences. Our Maker and Father has not designed us for comparison or for uniformity. Suffering touches everybody—but so does blessing. Every person has a purpose on earth and for eternity, whether or not it is perceived and appreciated. Putting this conviction into action by celebrating and sharing the abundant and everlasting life Jesus sparkles through each of us allows us to receive one another not only as neighbors but as among the highest of heaven’s gifts. We look forward to collaborating on select projects. We have begun exploring the development of joint educational resources and congregational activities, and we will participate together in united messaging efforts wherever our organizations’ missions intersect. To God be the glory!